3 steps to perfect upper and lower cabinet storage and organization! Your kitchen's upper and lower cabinets offer so much storage potential. They're deep by design, which can be tricky when trying to maximize the storage space of your pots, pans, baking sheets, cutting boards, plates, cups and more. Take a few cues from these tips below to make the most of your upper and lower cabinet storage! Upper Cabinets Upper cabinets tend to be tricky with their naturally shallower layout and height. To fix these two issues in your upper cabinets, use tiered or stacking shelves to utilize the open vertical space on each shelf. 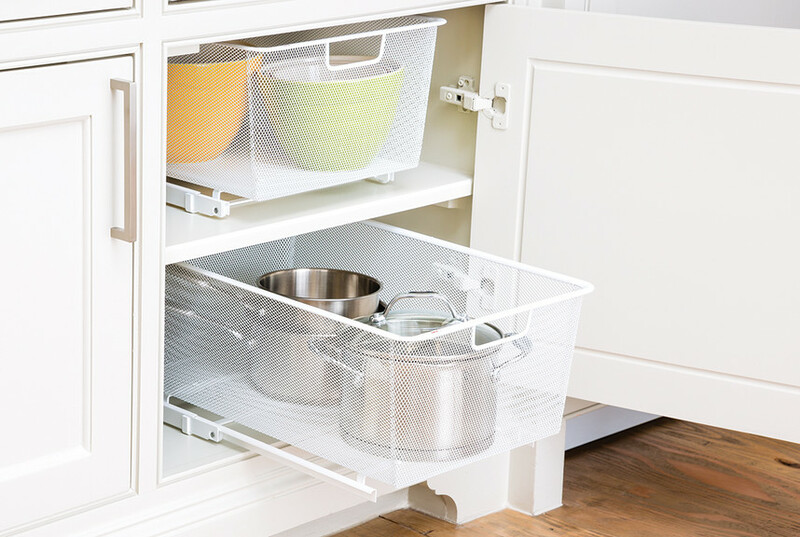 Now you can store plates, bowls and cups or canned goods without stacking them all on top of each other. 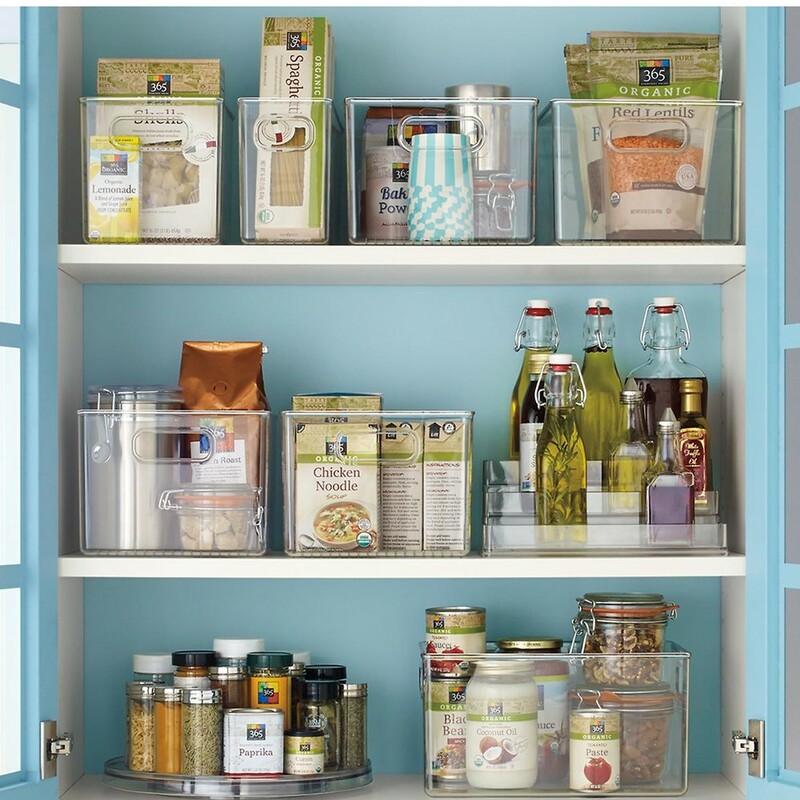 Also, think about using some convenient clear and handled bins like our Linus Pantry Binz. They're super durable and their handled design makes it easy to grab from a taller shelf to access what you need. Lower Cabinets Lower cabinets can be friend and foe all in one. Their deep space provides boundless storage potential, but their openness can create a conundrum of storage. A quick way to create easy access to everything you store in your lower cabinets, even in the way way back, is to install gliding drawers. In seconds, you can pull out your pots, pans and lids to be front and center, and the divided features ensure that they stay organized no matter how often you access them. Our elfa Mesh Easy Gliders are perfectly suited to store even your larger pots and pans while still making them a breeze to pull out and use. Spices We ALL have trouble organizing spices. It doesn't matter if you transfer them to clear containers or try to store in stackable containers, we always end up pulling them all out to try to find the one little jar of cardamom or all-spice you're looking for. Fix the spice space fight with the genius Lazy Susan. Lazy Susan's allow you to access dozens of spices in a single spin. That means no more searching for the cinnamon that's stacked above the dry mustard. Trust us when we say you should invest in several - we even use our Lazy Susan's to store crafts, nail polish, cleaning supplies and more. Nothing beats a Lazy Susan when it comes to accessible storage whether in an upper cabinet, lower cabinet or on a table. No matter what your cabinet clutter issue, a few simple fixes like these can transform your space into a place where you no longer have to search, sort or shuffle.